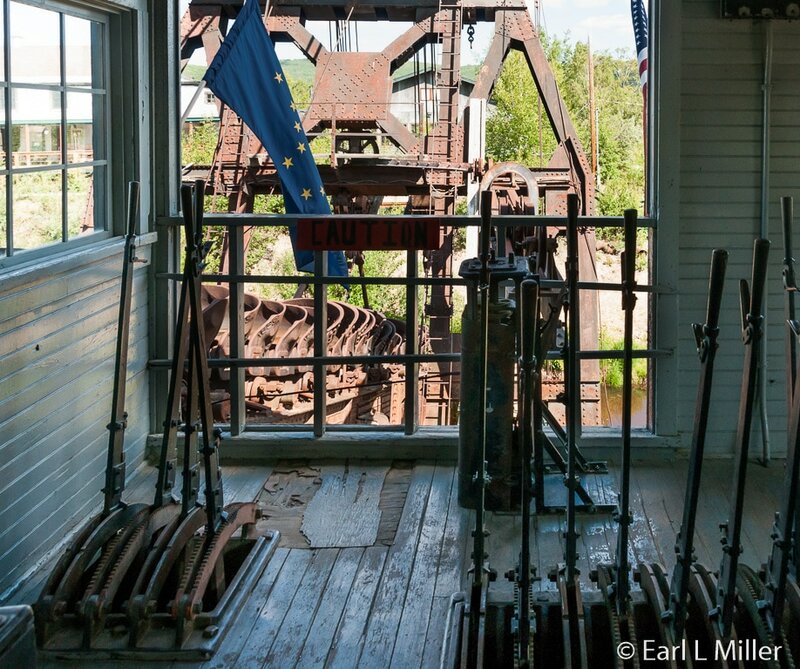 If you visit Fairbanks, make sure that tours on the Riverboat Discovery and to Dredge Number 8 are on your bucket list. Judging by the large number of tour buses labeled Princess, Holland America, Celebrity, and Royal Caribbean at both sites, the tour companies agree. 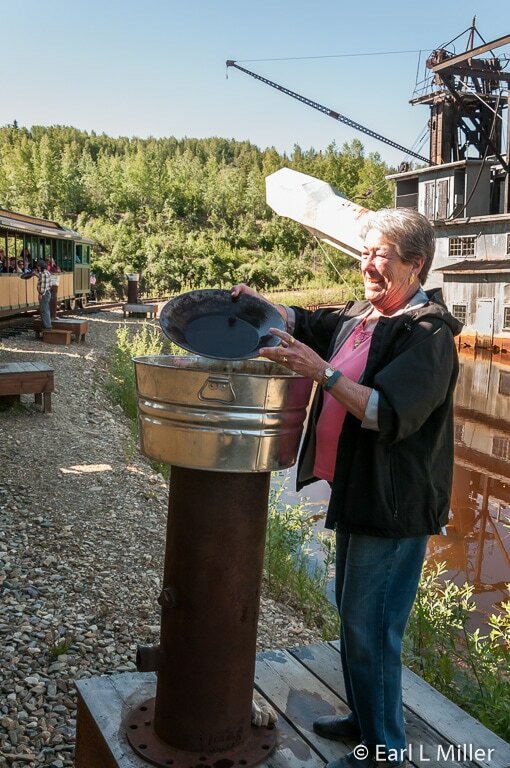 On Gold Dredge 8's two hour tour, guests pair a short trip on a narrow gauge train to a historic gold dredge with gold panning. The Riverboat Discovery, a three hour cruise, is an opportunity to watch Alaskan sled dogs pull an ATV, see a Bush pilot take off and land on the water, find out about the “Wedding of the Waters,” and learn about the Athabascan culture at the Chena Indian Village. The Binkley family, who runs the sternwheeler, has been involved with this kind of boat since 1898. Riverboat Discovery is currently run by the third and fourth family generations. It started when Charlie Binkley, in 1898, hiked the Alaskan Chilkoot Trail with other stampeders. His objective was not to prospect gold but to become a respected boat builder and pilot. His son, Jim Binkley, piloted freight vessels on the Yukon and Tanana Rivers in the 1940's - journeys lasting about 2,000 miles, ten times a year. 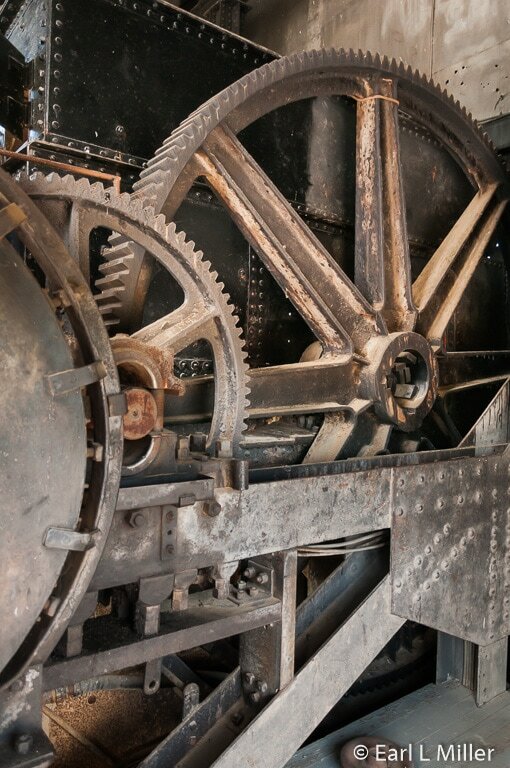 As transportation systems changed, planes and railroads assumed more of the loads. At one time, 250 sternwheelers plied the Alaskan rivers. By the late 1950's, the last of the sternwheelers retired. When that occurred, Captain Jim and his wife, Mary, started their river excursion business in 1950 with a 25-passenger boat. Jim built the company’s first sternwheeler, 150-passenger Discovery One, in 1955. Their three sons learned about the tourism industry and ways of the river as they worked on the boat. Each became a licensed U. S. Coast Guard riverboat captain. The business and fleet grew. Discovery II, carrying 300 passengers, went into service in 1971. 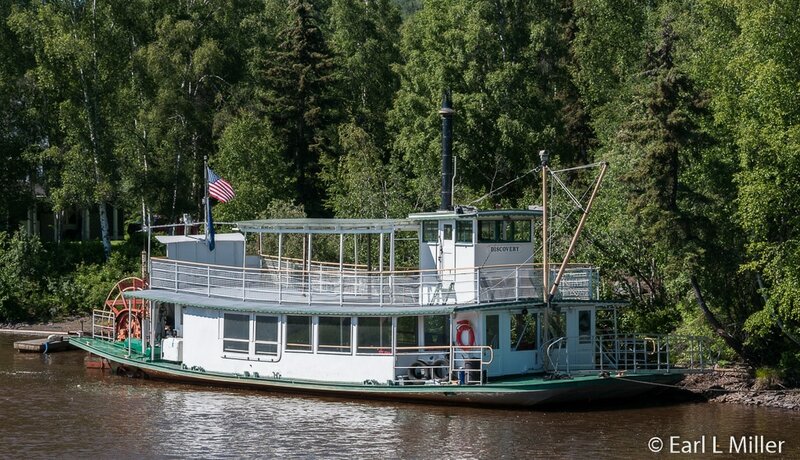 It was built on the steel hull of the last freight sternwheeler on the Yukon and Tanana Rivers. In 1986, Discovery III, the current sternwheeler used, was manufactured near Seattle and shipped to Alaska. It entered service in July 1987. It’s a comfortable four deck ship. You can easily move about as you listen to the commentary, watch camera shots from 19 monitors, or hear taped video clips. It has restrooms on the bottom three levels, a snack bar, and a gift shop. Mary is still involved today, but her children and grandchildren are in charge. Gold Dredge 8 is an historic dredge which operated in the Goldsteam Valley from 1928 to 1959 extracting 7.5 million ounces of gold. It was opened for tours in 1984 with the Binkley family taking over this attraction in 1994. The site listed as a National Historic Site in 1984 and in 1986 became a National Historical Mechanical Engineering Landmark. All boarded the open air, narrow gauge, roofed train for the 20-minute trip to the dredge. It’s a replica of the Tanana Valley Railroad. While on board, we listened to conductor Earl Hughes play old time fiddle tunes and provide commentary about mining in the Fairbanks area. In 1902, Felix Pedro discovered gold in this area. Five thousand miners, each supplied with a bedroll, rifle, pick axe, shovel, and a mule, if they were lucky, soon joined him. Many did not succeed, and Fairbanks never surpassed the gold rushes of Nome or the Klondike. One mining method we viewed, on the left side of the train, was a staff member demonstrating placer mining. For this method, water was pushed through material that was unloaded from an ore car into a bucket. A cable was then reset for the next load. Buckets went back and forth. A rocker box separated the larger rocks from the gold. 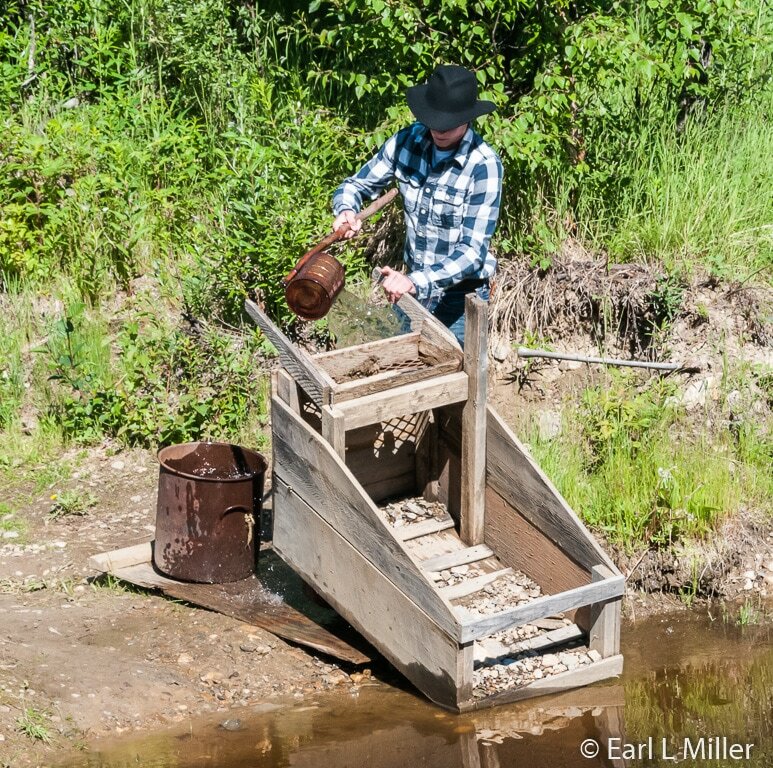 In 1920, the placer gold played out. The Fairbanks Exploration Company came into the area. Their goal was to expose the gold in the frozen gravel. The trick was to dig through the permafrost which required massive amounts of water - 9,000 gallons a minute, 24 hours a day, seven days a week for 220 days of mining. Hundreds of miners traveled to and camped at the top of the distant hill north of the dig. Primarily by hand, they dug a giant trench, the Davidson Ditch, which was 4 feet deep by 10 feet wide and 90 miles long. It diverted water from the Chena River to the mining claims. Water was piped downhill in a gravity type system through smaller and smaller pipes. This let a pressure, of 120 pounds per square inch, to build up resulting in a cannon like effect out of the three inch pipes at ground level. It took three years to prepare this area and get rid of the overburden. Due to Fairbanks long, cold winters, reopening the ditch and keeping it from freezing in late fall decreased the amount of time to mine. To counteract this, the F. E. Company built a pump house on the bank of the Chena River. The building contained 10 gigantic pumps that supplied 6,000 gallons of water a minute. The pump house’s heat generation equipment prevented the water from freezing in early spring and late fall. The water then ran down a pipeline along the ditch where it was used to wash away the overburden and replenish the water in the ponds. It operated between 1933 and the 1960's. That pump house, a national historic site as of 1986, is now a restaurant seen by passengers on their Riverboat Discovery tour. The train proceeded until we reached the dredge where Yukon Yolanda spoke to the group about this massive machine. The dredge had a 99-foot steel hull and was 50 feet wide. It had a draft of almost eight feet and displaced more than 1,000 tons of water. It combined the four basic functions of mining: digging, sorting, gold saving, and the disposal of tailings into a single mechanized plant. During its operation, the dredge only moved four to five miles. 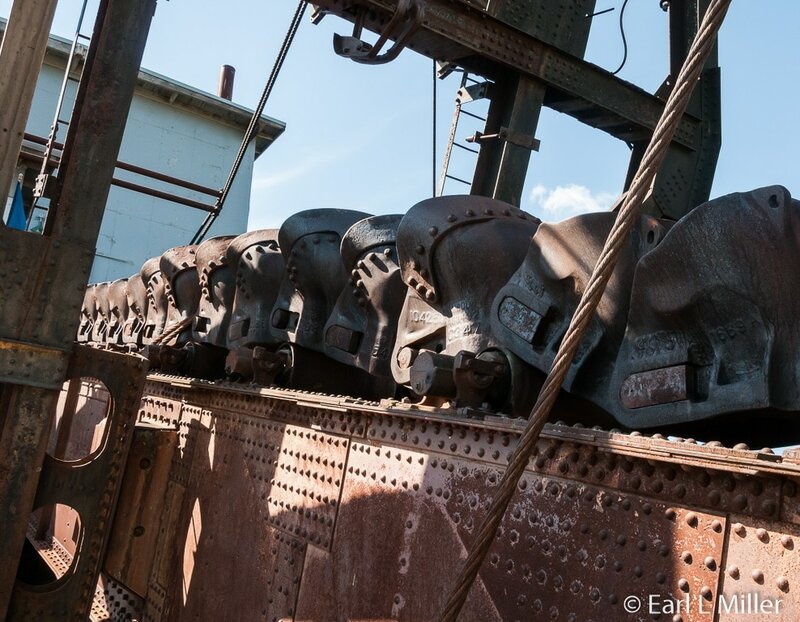 Bethlehem Steel’s shipbuilding division built the dredge. It was manufactured in 1927-1928 in San Francisco then barged to Seward to be carried on 114 flat cars by train. It was then railroaded to Fox, Alaska, at the head of the Goldstream Valley. In late August 1928, the dredge was ready to dig dirt. It dug up to 35 feet below the water line. It took 6-inch cuts acting very much like a chain saw in reverse. The bucket line consisted of 66 six cubic foot buckets, each weighing 1,500 pounds. Electricity powered the dredge. 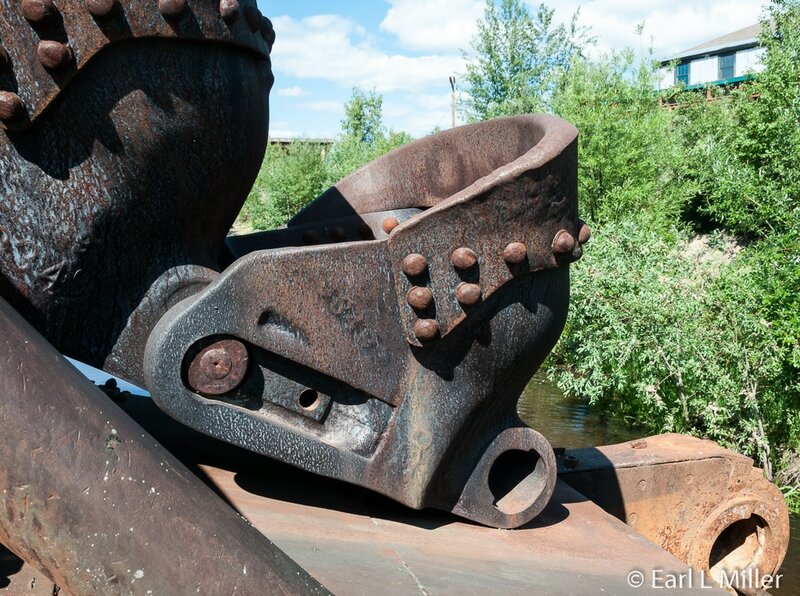 F. E. Gold Company had built a power plant in Fairbanks from which to run four dredges. 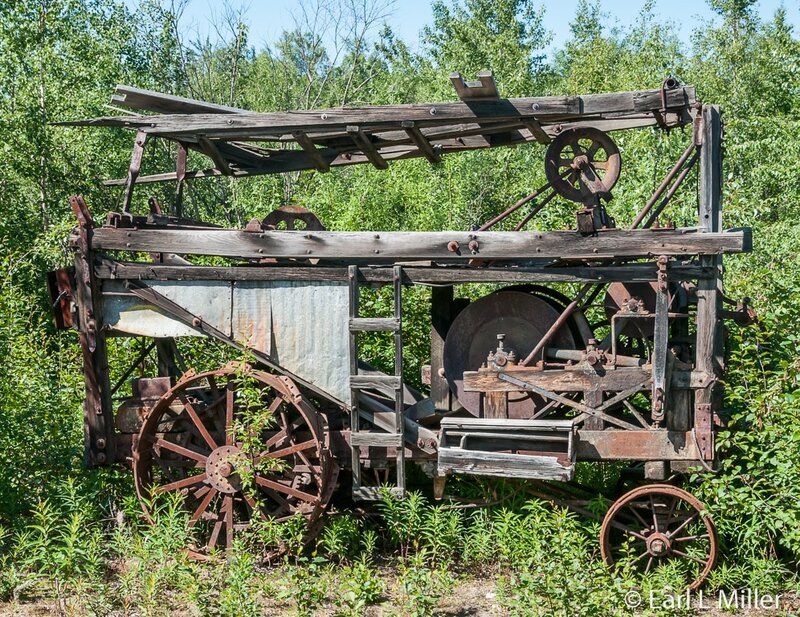 This plant still exists in Fairbanks today but is run now by Golden Valley Electric. At the dredge’s top speed, the bucket line moved at the rate of 22 per minute into the dump hopper which was shaped like a chute. Nine thousand gallons of water, along with the gold and thawed dirt, gravel and rock, dumped per minute into the trommel. 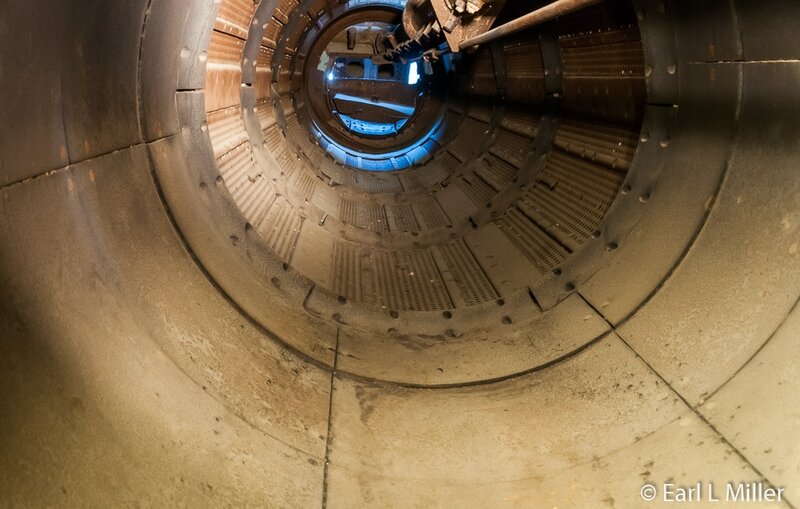 The trommel was a steel tube perforated with holes, 36 feet long and 6 feet in diameter. It mounted on a slope at a rate of almost two inches per foot. The holes ranged from 3/8 inch at the top end to 1-5/8 inches in diameter down the trommel’s length. Many have compared the trommel to a large washing machine lying on its side. As the trommel rotated rocks, the larger gravel worked its way to the lower end and on to the conveyor belt operating at a rate of 262 feet per minute. The conveyor belt then deposited the tailings at the dredge’s stern. Finer material, including the gold, and water exited the trommel through the perforated holes and into the sixteen sluice boxes consisting of wooden steps called riffles. They were lined with Cocomats (made from coconut husks). Since gold was 20 times heavier than water, it was trapped in the mats. The waste material washed out of the sluice boxes. Fine sand, rock, washed gravel, and non gold-bearing ore were considered waste. 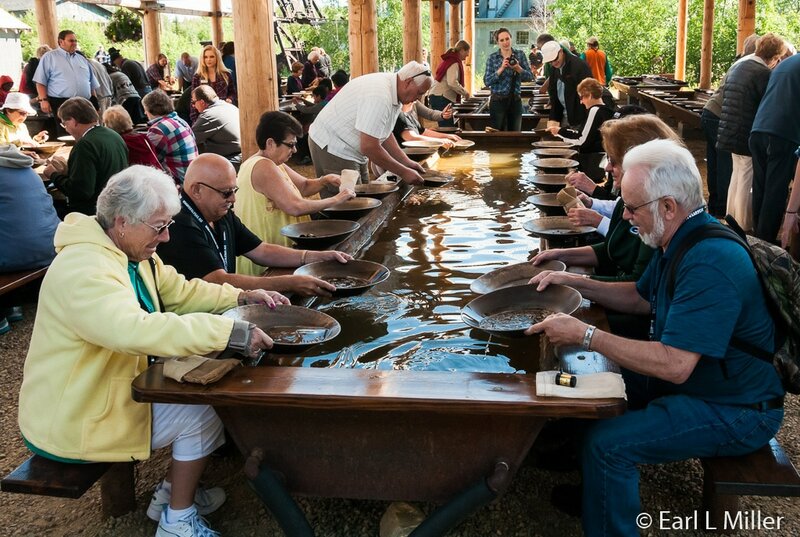 The mats were removed every 48 hours for washing with an average of 4,000 ounces of gold taken to the Gold Room. Cleaned mats were returned. Every two weeks the dredge shut down so all boxes could be cleaned. After being shoveled into lock boxes, the gold was sent to town for refining. It was melted in a furnace to burn off impurities. Gold bars were made weighing 58 pounds. They were assayed, stamped, wrapped, and sealed then sent to the San Francisco mint. 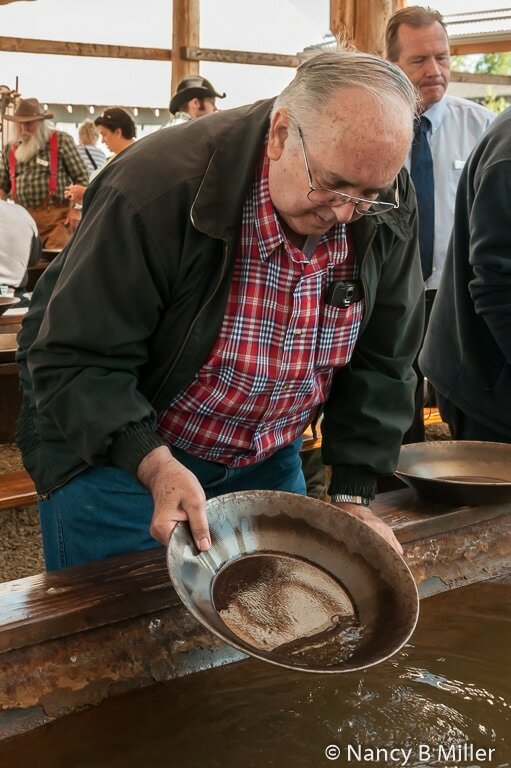 While at the dredge, the staff demonstrates the successful method to gold pan. It’s basically a layering process. The key is to apply smooth shaking from side to side for 10 to 12 seconds allowing the rocks to slide to the front of the pan. Water, which must always be in the pan, is added as needed. Everyone on the tour is handed a small bag guaranteed to contain gold concentrate. They then sit at tables with comfortable benches and warm water to pan. Those who wish can have their gold assayed and made into charms, bracelets, and pendants at the assayer’s office. 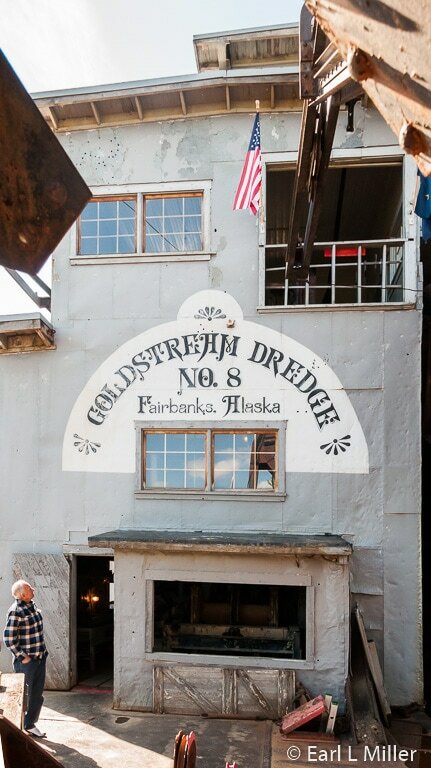 Afterwards, it’s time to explore the shops or check out the signs about the dredge and Fairbanks gold history. A 20-minute film contains actual footage of the dredge in operation. Another option is to take a self guided tour of the dredge. Staff serves complimentary freshly baked cookies, coffee, and hot chocolate in their gift shop. 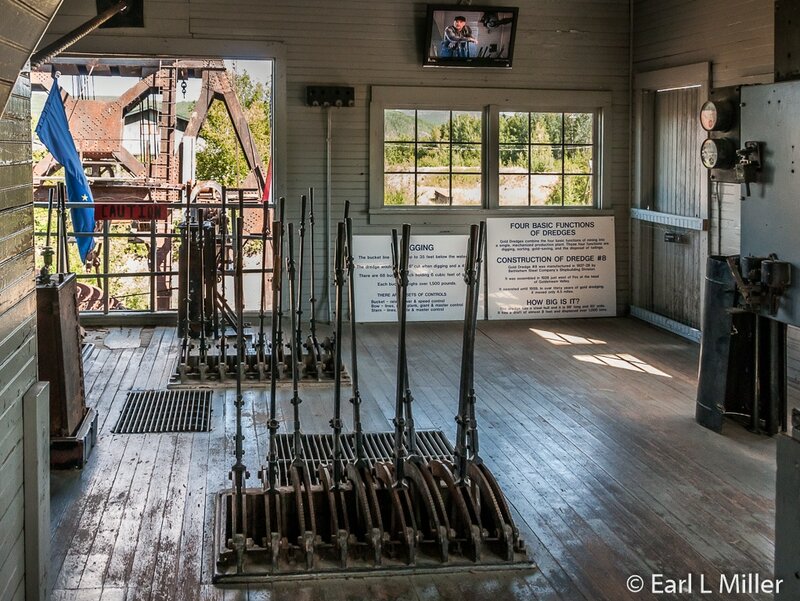 On the return train trip, you pass old mining equipment and the facilities of F. E. Corporation including bunk houses, their dining facilities, the Dredgemaster’s house, and the main office. In 1942, gold mining suffered a serious setback when the War Production Board forced the closure of all gold mines for World War II’s duration. Very few mines reopened after the war as miners had entered other professions. Gold Dredge 8 did reopen and ran successfully for a few years. 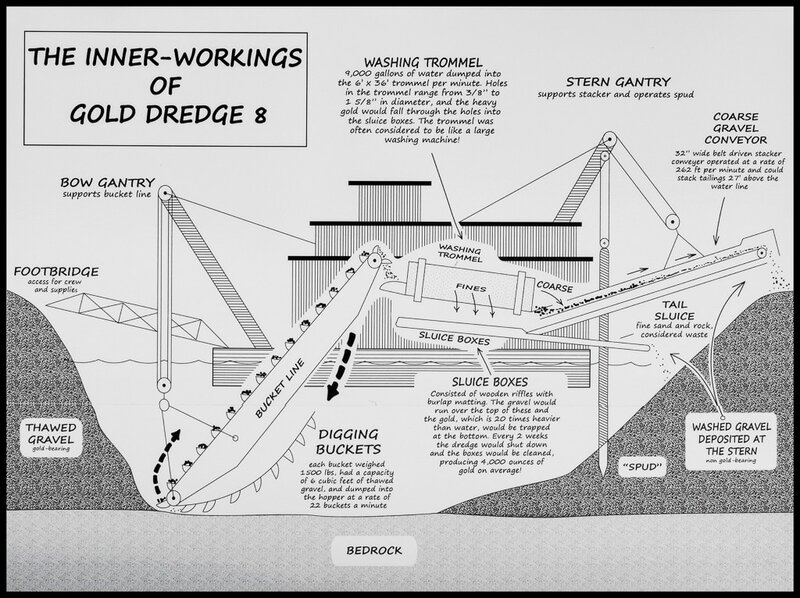 The last gold from the dredge was removed in 1954. The mine shut down in 1959 for economic reasons. The tour is offered twice daily from mid May to mid September. Reservations are highly recommended with check-in advisable 15 minutes prior to departure time. 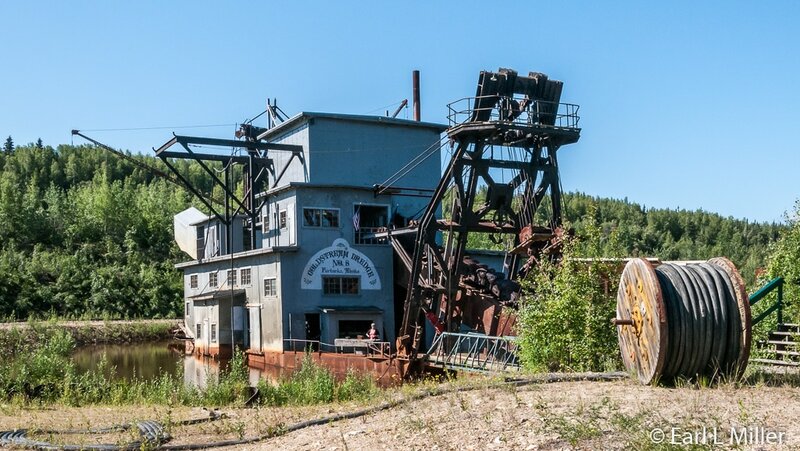 Gold Dredge 8 is located 25 minutes from downtown Fairbanks at 1803 Old Steese Highway. For reservations, call (866) 479-6673. Adult rates are $39.95 while children (ages 3-12 ) are $24.95. Children under age three receive complimentary fares. Tour times are 10:30 a.m. and 1:45 p.m. If you are combining your tours, you will need a place to grab lunch. At the Pioneer Square’s Discovery Dining Hall, we paid $11.95 apiece for a tasty, all-you-can-eat Miner Stew accompanied by an apple pecan salad, sourdough rolls, brownie, and ice tea. Ice water and coffee are also complimentary. It’s served family style. Captain’s Corner offers boxed lunches (sandwiches, pasta salad, chips, and a soda). Galleys aboard the boat provide such snack foods as reindeer dogs, chili, etc. Our boat departed from its landing at 2:00 p.m. 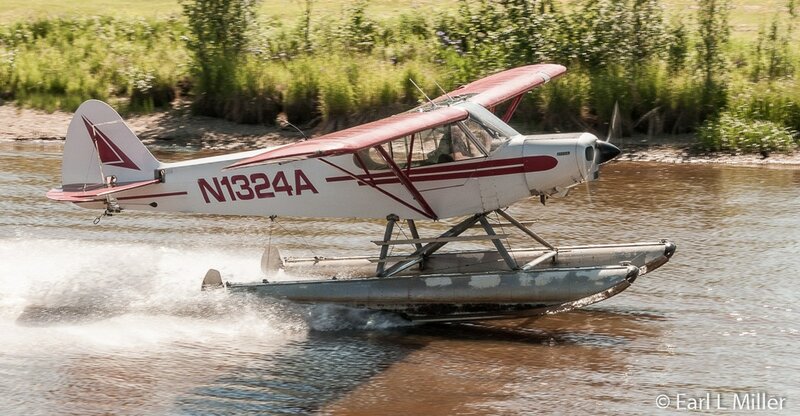 Shortly afterwards, a bush pilot in a 1951 Piper Super Cub rode by on the water taking off twice. He had tundra (big balloon) tires, which looked like floats, on his plane allowing for takeoffs and landings on rivers, glaciers, and sandbars. During the winter, these floats are exchanged for skis. We listened to his comments on the radio. Our guide said 92% of the Alaskan population rely on aircraft. We passed the 1955 original Riverboat Discovery, beautiful log homes, a boat yard with boats of all shapes and sizes, and the Pump Restaurant, the facility used by the dredge to pump water during mining days. Our narrator also pointed out Senator Lisa Murkowski’s home where the Reagans had stayed for three days in 1984. The boat stopped without docking at Susan Butcher’s former home, Trail Breaker Kennel. 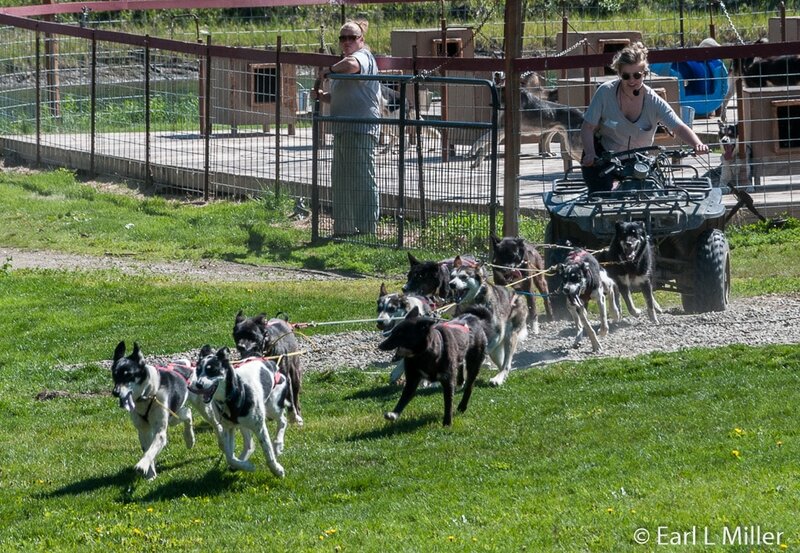 Susan won the 1,100 mile Iditarod Dog Sled Race from Anchorage to Nome four times. With her husband, Dave, they became the most dominant racing team in Alaska. Unfortunately, she lost her toughest race, to leukemia, on August 5, 2006. Now Dave and their two daughters continue to love the dogs in Susan’s honor with the girls becoming accomplished mushers in their own right. 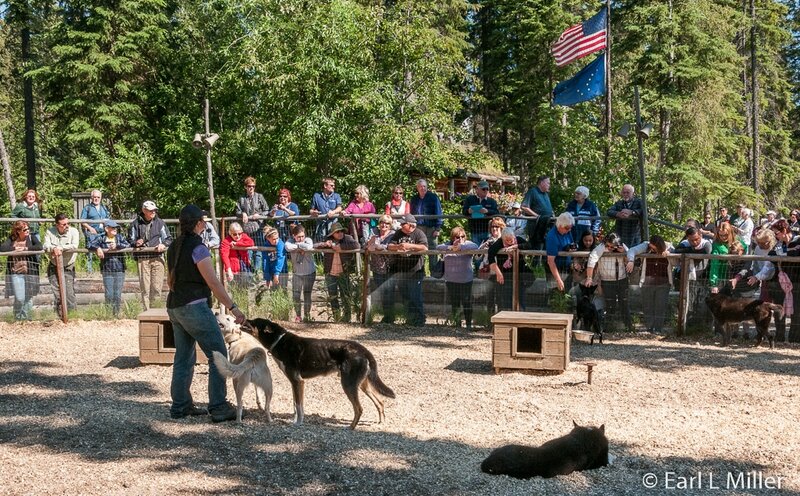 Scattered around the property, one sees a variety of dogs and pups, all Alaskan huskies. Jessie Royer, Susan’s protégée, spoke to us about their training. She later appeared at the Chena Village to answer questions. Jessie informed the group that dogs start training the moment they are born. Puppies take walks in the woods where they conquer uphill rocks and climbing over logs. At six months, dogs are selected to race. They’re trained throughout the year as it takes four seasons to teach them all they need to know. During the summer, they’re harnessed to a ATV so they can feel the weight behind them. Jessie harnessed them and ran them around the property so all could see. It was obvious the dogs loved to run. When the dogs returned, each got a pat and all went swimming in the river. Most huskies are used today for racing rather than carrying supplies and people as they had done during the past. The boat passed where the Chena River, which is clear water, joins the Tanana River, which is full of glacial silt (powdered rock). It is 570 miles long, drains 44,100 square miles, and rises out of a glacier the size of Rhode Island. A definite line exists between the two called “The Wedding of the Rivers.” The Tanana pushes the Chena around. The Chena pushes out while the Tanana pushes in. The Tanana is difficult to navigate because of the individual channels of the braided river system. As the landscape changes, it’s necessary to read the river and determine how the river flows, how fast it flows, which of the channels are deep or shallow, where erosions and depositions are, and most important the surface patterns. It’s important to learn where the sandbars are, which changes from time to time. Three species of salmon dominate the river - king, silver, and chum. The salmon are born in fresh water each spring and swim to the ocean 3,000 miles away after one or two years. They return home at ages three to seven. 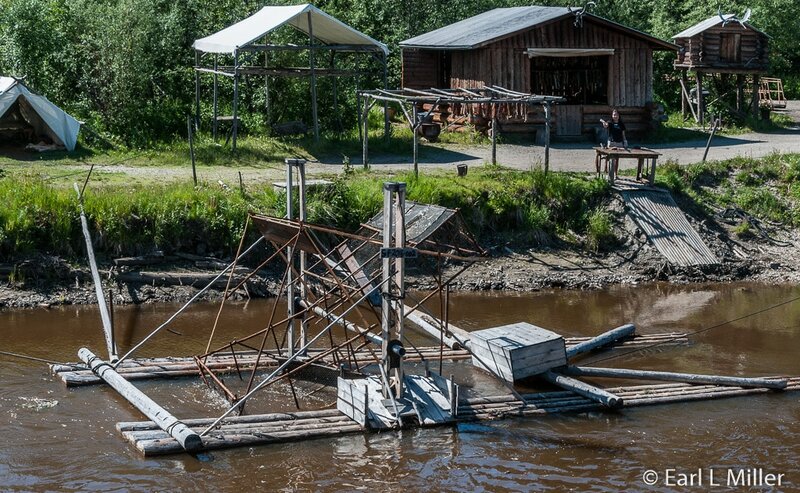 We spotted a large fish wheel near the Chena Village. It was made from spruce poles which families build themselves. The fish swim into the rotating wheel and are lifted up and dropped into a net. It allows salmon to be caught as fast as they approach the wheel. Near it was a cache, a storage shed on stilts; tents; and dog houses, since dogs warn of other creatures. A fish camp had been set up. At the village, before disembarking, one of the Native Alaskans spoke on the basics of salmon fishing and cooking. Since there are twice as many chums and the meat is inferior, this fish is fed to the dogs who eat fish head stew. People dine on king or sockeye filets with fish head soup, from these two species, being a delicacy for the elders. The process is to first cut off the head and separate the filets from the backbone which is still attached to the tail. Salmon can be scored (cutting the skin into the flesh). That creates more surface area allowing smoke to work its way through and further dehydrate the fish similar to a Saran fish wrap. The fish are hung on a salmon drying rack until they have developed a sheen or a glaze. Then they go into the smokehouse for two weeks after they are fully dehydrated. Sometimes they are cut into long vertical strips. If these are wet when first placed inside the smokehouse, they can become moldy. Sometimes the salmon strips are smoked in a brine of sugar, honey, and salt for two days creating a jerky texture. At other times, Athabascans eat the meat off of the skin that is cooked on an open fire until it curls. Wood used for smoking fish for people is alder or cottonwood while for the dogs it’s driftwood and sprucewood. Each family has its own traditions and techniques. The narrator on our boat spoke about the reindeer we were seeing near the village’s ancient area. Reindeer provided meat and hides. It was thought their number would decline when the pipeline was built. Such has not been the case and they are doing well. Our tour group was divided and taken to three stops within a half hour. Then we had a half hour to explore the village on our own and watch the dog demonstration. The village’s purpose is to show how the Athabascans now live and how they survived before and after the Europeans. Native guides describe how they built boats, designed shelters, and processed food. At this first stop, our guide explained how they hunted moose. A rake is scraped against a tree to attract the moose’s attention and a moose call given. After the moose was provoked into charging, a spear, though sometimes a club or bow, was used to kill it. When an animal was killed, Athabascans used all parts whether it was for food, clothing, or shelter. We saw moose, grizzly bear, and caribou pelts tied on a line. Then we heard how the women prepared the hides. They scraped off all the meat, fat, hair and flesh from the rawhide. Then they cut rawhide into strips placing the hide into fermented moose brains and water so an enzyme would break down the fibers. After weeks of soaking, scraping, and wringing, the hide became soft. Scraping was done with a kervat, similar to an Eskimo Ulu, but with a serrated edge. The final process was to stretch the material. Our tour guide showed off a maiden dress, chief’s coat, and a winter parka. Traditionally the hides are light brown or smokey in color. The Athabascans have become known for their beadwork with patterns on the clothing relating to where that person is from. Women decorate with flower designs, buttons, and caribou antlers. 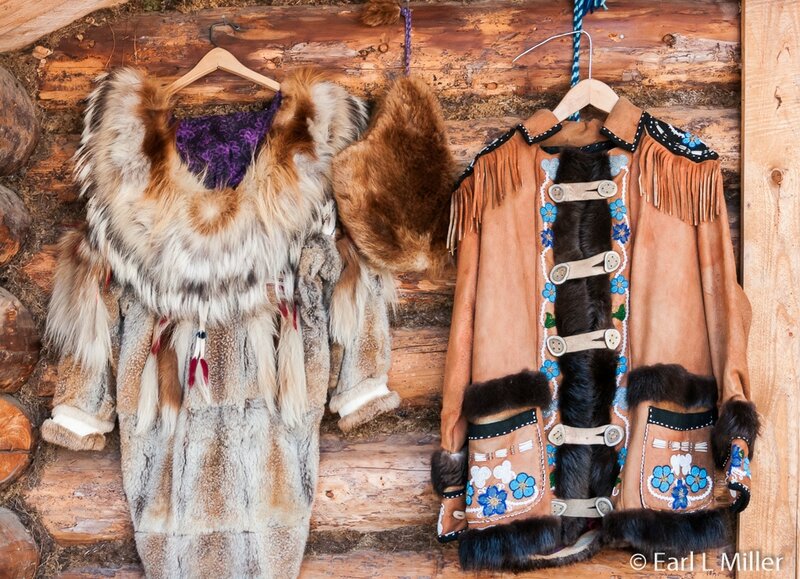 The men trim with animal tracks.That brings luck to hunters and trappers. Traditional dress passes from mother to daughter. The guide demonstrated a parka worth twenty thousand dollars which took 6-1/2 months to make. It was made of muskrat and trimmed with beaver and otter fur. Part of the coat was made of timberwolf. Wolverine fur was closest to the face since it contains natural oil. Leftover trimming, that was sewn on, was from the timberwolf while designs on the back were of caribou. It was a pullover style that had been passed down for generations. The second stop showed a variety of pelts and demonstrated how the Athabascans constructed a cabin. The Athabascans were migratory before settling into permanent villages. They built their homes entirely from local resources. On this tour, you see a log cabin, an Athabascan house, and a cache. They covered their white spruce tree walls with a layer of birch bark since it was waterproof. Between the walls, they kinked moss. The roof was spruce covered with birch and grass on top. This was done to protect it from the elements and eliminate excessive rain. The more grass on the roof, the more the home was insulated. A typical roof lasted five to seven years. 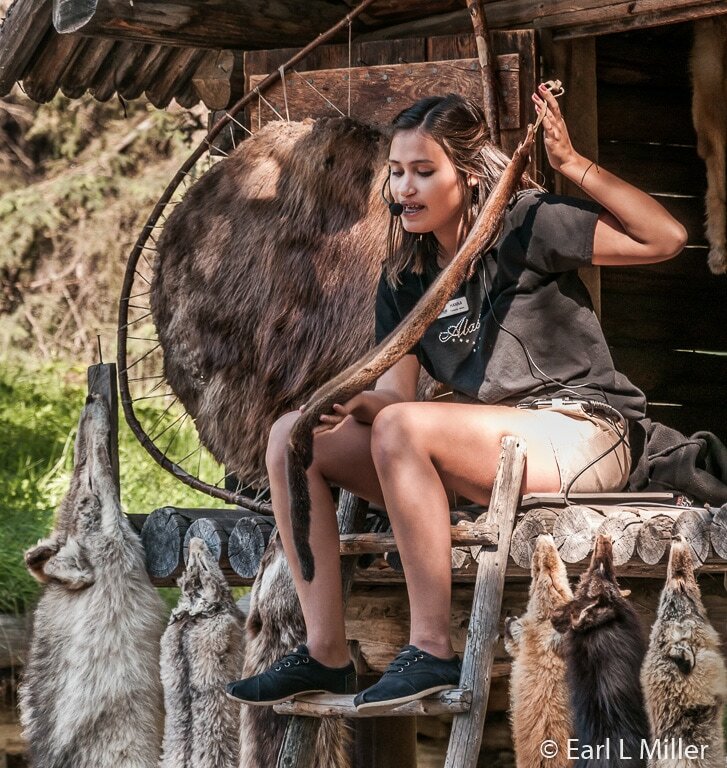 As our guide handled each pelt, she talked about the importance of each animal or its characteristics. This included the timberwolf, lynx, wolverine, and ermine with its white winter coat. She pointed out the red, silver, and cross fox. Handling the arctic fox pelt, she mentioned that this species was not found near Fairbanks. She mentioned that a muskrat’s fur is very warm and is used to make parkas. The martin was used for women’s hats including leaving the tail on for decorations. Beavers have two layers of fur. Their undercoat is soft and downy with warm guard hairs on the outside. The Athabascans considered beaver meat a delicacy. Beaver fur was used for hats, mittens, and gloves. Mink fur didn’t have much value originally as it was too short and not warm. However, after the Europeans arrived, it became their money coat. The third stop covered ancient Athabascan traditions before contact with the European world. The Athabascans who lived 10,000 years ago were hunters and gatherers roaming the Arctic. They put fences along the way to slow animals down then funneled them into pens where they would be killed. Snowshoes allowed the men to outmaneuver a solitary moose or caribou. Nothing was ever wasted of an animal since their bones, meat, and liquids were all used. Their original structures were all temporary. A skin hut was made of bent birch with caribou hide for protection. Our guide next pointed out the first bubble dome, A double lean to was used by the men when they hunted. It had a birch frame. They used punk for fires. It’s a fungus that grew on the birch tree trunk. They carried it in a caribou hide pouch, let it smoulder, then lit it. Travel was via birch bark canoes. These were constructed of breadfruit covered with a layer of birch bark sewn together with split spruce and pre stitched with fat and caribou hair. It held ten hunters and their gear. Birch bark baskets were used to gather, store, and cook food. When cooking, water had to be added, creating a slow boil. Birch was also used for baby baskets. Now the challenge for the Athabascans is to continue their traditions while maintaining a modern way of life. They do this by going to school and listening to their elders. Along the trail, we noted an old Polaris snow machine and an old Piper Super Cub. We also saw Chief Silas’s cabin with bark roof and a salmon smokehouse from the original Chena village. At the village, we stopped at a ring where Trail Breaker kennels had brought some of their dogs. Jessie spoke about their care and about the Iditarod. The dogs are bred for traveling long distances instead of appearance. Currently 80 dogs live at the kennel. We learned that booties on the dogs’ feet are the musher’s biggest expense. It protects the dogs from ice, hazards, sleet, and snow. Dogs go through a nylon set about every 50 miles. They’re fed a high protein dog food with lots of meat since they need 2,000 to 3,000 calories a day at home and 10,000 calories on the trail. When dogs retire, they run in harness until they are about 13 to 14 years old. After that, they just run around. On the boat while returning from the village, we were offered a tasty salmon treat. Jim Birney is known for his salmon recipe. He mixes two cans of salmon with eight ounces of cream cheese. We checked out the gift store at Steamboat Landing when we returned. It offered gifts unique to Alaska and the native culture. Canned salmon was available at the gift store and on board. Riverboat Discovery is located at 1975 Discovery Drive in Fairbanks. To make the required reservation, call (866) 479-6673. Adult rates are $62.95 while child rates (3-12) are $39.95. Children under age three are complimentary. The tour runs mid May to mid September at 9:00 a.m. and 2:00 p.m. Guests should arrive 30 minutes prior to departure.